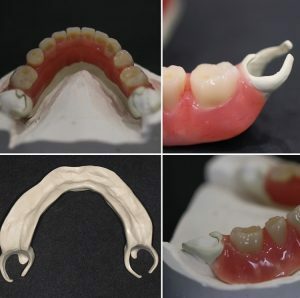 Since using Ultaire AKP our laboratory have started documenting cases where Ultaire frames offer solutions to tricky cases or where other prosthesis have failed in the past. Here are a few different options for designs that we have worked on in the past month or so. This case was all about the clasp design. As Ultaire frames can engage deeper into an undercut they offer more stability due to the width than a conventional chrome clasp. 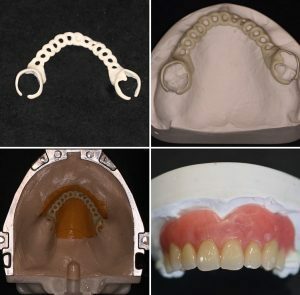 The Ultaire frame was designed on 3Shape then the denture was processed using the Ivocap technique. The slight flex in the material allows the frames to engage into lingual undercuts. This lower partial is an example of this. Using Ultaire for the fitting surface gives strength to prevent fracturing, which is common in cases like this. 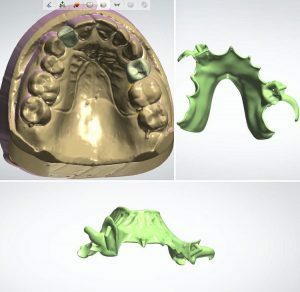 This is a great option for patients with a tight occulsal scheme that can be prone to fracturing single teeth in bounded saddle areas. A few screen shots of this framework being designed using 3Shape. 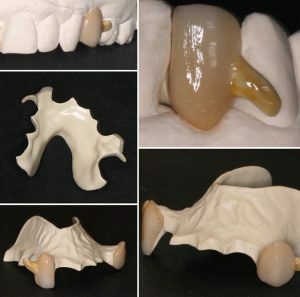 The frame incorporates the occlusal surface on the upper left premolar and as a backing on the upper right lateral. The strength of Ultaire will prevent any fracturing. 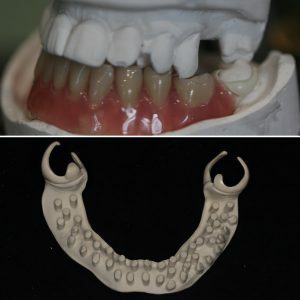 The frame is then finished with the buccal of the pre-molar and the labial aspect of lateral built up using TWiNY composite. The initial feedback from patients is that they prefer the sensation of having the Ultaire as the occlusal surface rather than chrome. The clasps have been characterised/stained to enhance the cosmetics. 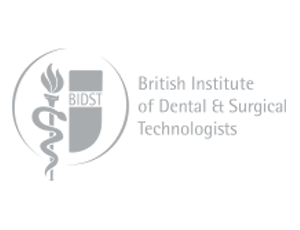 If you would like any more information on design options, whether your a laboratory or a dental practice, please don’t hesitate to call us on 01423 520368.